The Fellowship was fortunate enough to obtain a copy of CURSE #1 from BOOM!Studios. The story is by Michael Moreci and Tim Daniel, with art by Riley Rossmo and Colin Lorimer, and lettering by Jim Campbell. Things are not good for Laney Griffin; a former college football player and possible first round draft pick until a freak injury ended that dream. Now he’s a desperate man, willing to do anything to raise funds to help his very ill son. Meanwhile, there have been several gruesome killings going on in town. Laney sees this as an opportunity to capture the murderer or animal that is responsible in an effort to collect the reward. But what will he find in the woods? What is he willing to do to save his son? I can’t explain it, but there is something about this book that really caught my attention and wouldn't let go. You really feel the desperation in Laney’s situation, and on top of that you have a werewolf on a murder spree! Definitely like what I'm reading here...I'm in. 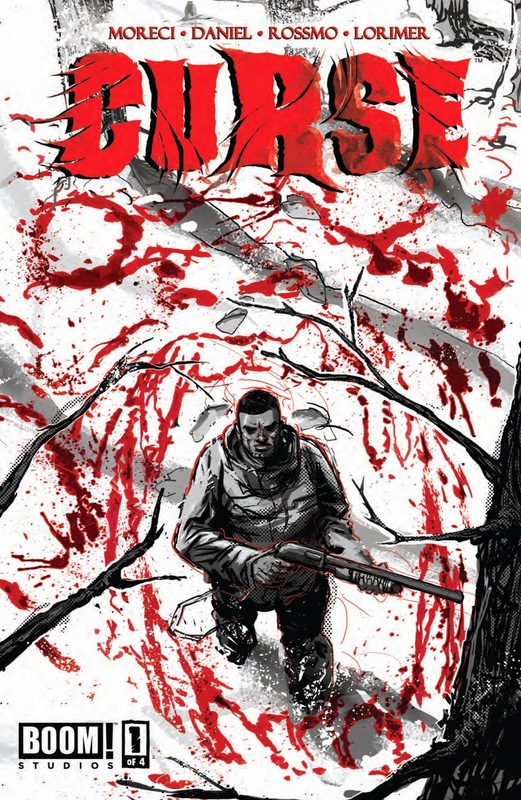 CURSE #1 is in stores now, or available to order at www.Boom-studios.com.